First of all, Happy Valentine’s day to everybody. I made this cake on Friday with Valentine in mind. The yellow and red roses are made of marzipan, including the green leaves. 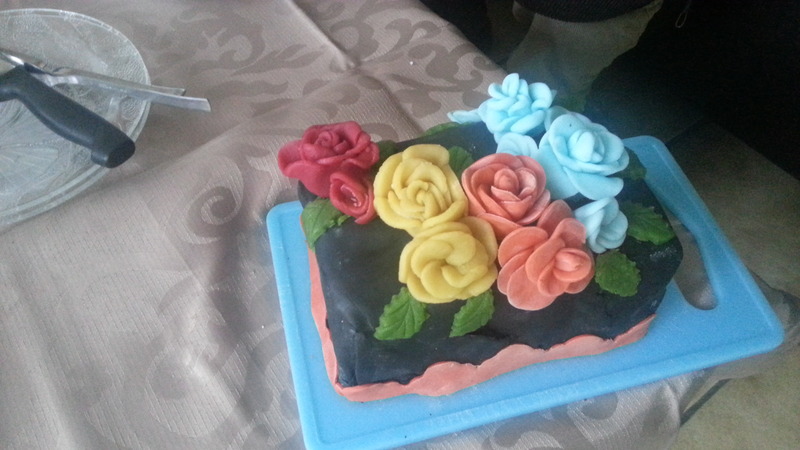 The rest of the flowers and decoration is made with fondant and this time there is a chocolate cake inside. It was planned for today but yesterday our neighbour came at the door asking if we had heard noises last night. It turned out somebody had smashed the window of his car on the passenger side. Our car which was parked right next to it was unharmed. He was extremely upset over this and really convinced they were out to get him. I have to mention that he grew up in a Slavic country which had it’s share of wartime, so this might explain his sensitivity. We helped him to get rid of the glass on the parking lot and his car and taped some plastic over the gap to protect the inside of the car. After that we invited him in for a cup of tea and as the shops were already closed I offered him a slice of the cake. Of course I didn’t tell him it was meant for the day after, so he had no reason to decline. He finally left a lot happier after this. Unfortunately these things happen. There are a lot of people out there who don’t care if they hurt someone else and go around kicking the sh*t out of things and people. It’s happens and 9 out of 10 times it’s not directed at you so there is no use in getting to upset over it. Don’t understand me wrong, I’m not saying I do approve of these actions, but there are moments you just need to step back and let go. Well, don’t let this story ruin you day. I hope your day will be filled with marvel and love.